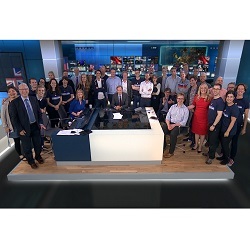 Following the tumultuous events of referendum night, here’s a group photo of the ITV news team, with Manchester’s Professor Jane Green, who followed the twists and turns of the night’s events. Professor Green, who is one of the nation’s leading political scientists and a co-director of the British Election Study, worked through the night with Tom Bradby, Allegra Stratton and Professor Colin Rallings in the ITV studio. Manchester’s Dr Chris Prosser was also in the studio, using British Election Study data to help call the result.